Plant growth regulators have sought extensive adoption in the modification of plant physiological processes that include regulating the plant metabolism and inhibiting or stimulating enzyme systems. Plant growth regulators also seek robust demand for the regulation of cotton metabolism. Growth in the textile industry across countries such as Turkey, Germany, Bulgaria, India, and China, is anticipated to create high demand for cotton, thereby driving adoption of plant growth regulators. In a bid to ensure crop protection and curtail production costs, farmers are being compelled to opt new methods that include use of agrochemicals and organic farming, on account of increasing profitability concern. This will further create high demand for plant growth regulators, particularly in the agriculture-driven economies. However, robust foothold of fertilizers in the agriculture sector, which has endured for a long time, is likely to constrain demand for plant growth regulators to a certain extent. Stringent regulations pertaining to pesticides are also anticipated to restrain demand for plant growth regulators by shifting the farmers’ focus toward cost-effective, bio-based alternatives. 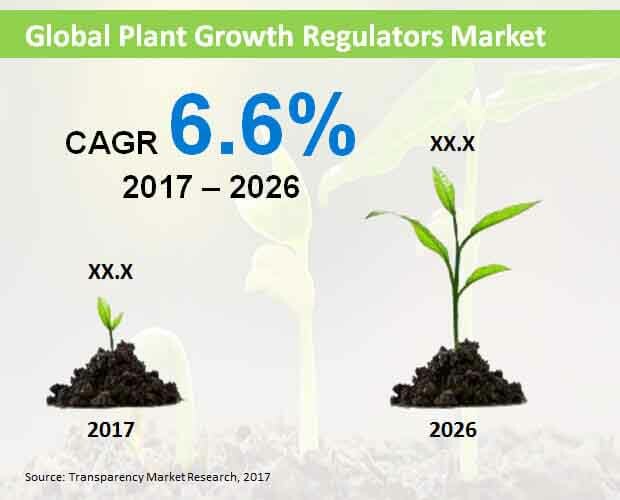 As projected by a new Transparency Market Research report, the global plant growth regulators market will reflect an impressive growth during the forecast period, 2017 to 2026. Worldwide sales of plant growth regulators are estimated to account for more than US$ 3,000 Mn revenues by 2026-end. Among various hormone types in the plant growth regulators market globally, cytokinins are likely to lead the market in terms of revenues through the forecast period. Cytokinins have been increasingly employed for as key phytohormones for inducing cell division in the plant shoots and roots, along with improving dormancy, cell enlargement, fruiting, and flowering in plants. Cytokinins are highly sought-after among various industrial sectors including cosmetic, agriculture, food, pharmaceutical, and biomedicine. Fruits & vegetables are likely to prevail as the dominant crop type in the global plant growth regulators market. Utilization of plant growth regulators in fruits & vegetable crops helps in preventing their senescence and enhancing the overall yield. In addition, growing health-consciousness among consumers has led them in preferring healthier and more nutritious consumption habits by incorporating a wide variety of fruits and vegetables in their diet. Adoption of organic farming activities has surged considerably in Europe, with larger availability of arable land for organic practices. This has further driven adoption of bio-based substitutes of fertilizers such as plant growth regulators. In addition, textile industry across European countries are witnessing robust expansion. On account of these factors, Europe is expected to remain the most lucrative market for plant growth regulators. Water-dispersible and water-soluble granules are expected to remain preferred formulation of plant growth regulators, with sales projected to bring in nearly US$ 1,800 Mn revenues by 2026-end. However, wettable powders are estimated to reflect fastest sales expansion through 2026. Plant growth promoters by function are likely to spearhead the global plant growth regulators market in terms of revenues. Although dominated by few well-established companies, the global market for plant growth regulators is highly competitive in nature. This is mainly because of vast geographical reach of these companies along with their massive production facilities worldwide. The leading companies producing plant growth regulators compete in terms of the product quality, cost, and innovations. Nonetheless, a sizeable number of small local & regional vendors hold significant market shares. TMR’s report has profiled key participants driving growth of the global plant growth regulators market, which include BASF SE, FMC Corporation, Bayer Cropscience, Somitomo Chemicals Company LTD, Xinyi Industrial Co., Ltd., Syngenta AG, Nufarm Limited, Valent Bioscience Corporation, Dow Chemical Company, and WinField Solutions. Tremendous surge in expansion of the organic industry is considered to be a major factor fuelling demand for plant growth regulators. Soaring awareness on health hazards apropos to utilization of chemicals in household and food products has been impelling individuals in shifting their preference toward organic food products. In addition, there has been a rapid growth of the pharmaceutical sector in the recent past, driven primarily by rising prevalence of chronic diseases, growth in aging population, unhealthy consumption patterns of consumers, and their changing lifestyles. Growing pharmaceutical industry entails the requirement for herbal medicines, owing to rising prices of their allopathy counterparts. Leading pharmaceutical companies have been making huge investments in research and development of plant-derived medicines for coping up with growing demand for herbal medicines. These instances will further create demand for plant growth regulators in the foreseeable future. A new report of Transparency Market Research offers forecast and analysis on the plant growth regulators market at a global scale. The report delivers actual data related to the market for the historical period (2012-2016) along with an estimated intelligence on the market for the forecast period (2017-2026). The information is presented in terms of value (US$ Mn). Macroeconomic indicators coupled with an outlook on the plant growth regulators demand pattern around the world have also been encompassed by the report. The report further imparts key drivers & restraints for the global plant growth regulators market, and their impact on regional segments included over the forecast period. The executive summary chapter, which initiates the report, offers key market dynamics and numbers associated with the global plant growth regulators market, along with key research findings related to the market segments comprised. The market numbers included in this chapter are a blend of compound annual growth rates, market shares, revenues, and volume sales. A concise introduction to the plant growth regulators market is offered in the chapter succeeding the executive summary, along with a formal definition of “plant growth regulators”. Elaboration of the market dynamics that include future prospects, growth limitations and drivers, and trends has been delivered in the chapters subsequent to the overview. These chapters also inundate insights apropos to bottom line of enterprises in detail, along with the fiscal stimulus and the global economy. Forecasts on the global plant growth regulators market have also been delivered in chapters propounding a segmentation analysis. The report has categorized the global plant growth regulators market based on hormone type, crop type, function, formulation, and region. A comparative analysis has been offered on the market segments with regard to year-on-year growth, revenues, and market share. The market numbers relevant to this comparative analysis have also been delivered in these chapters. Regionally, the global market for plant growth regulators has been branched into Middle East & Africa, Asia-Pacific excluding Japan, Japan, Europe, Latin America, and North America. A complete package of intelligence on leading participants supporting expansion of the global plant growth regulators market has been offered in the concluding chapter of this analytical research report. This chapter elucidates the competition landscape of the global market for plant growth regulators, providing information on key strategy implementations of the market players, their product overview, key development, company overview, and key financials. A SWOT analysis on each market players has been provided in this chapter of the report. Additionally, the geographical spread of the market players included, along with their future growth plans, intended mergers & acquisitions, overall revenues, and market shares are elaborated in detail in this chapter. The report has employed an intensity map for portraying key market players located across geographies.